AMES, Iowa – November 21, 2017 – Alliant Energy and Ames Economic Development Commission (AEDC) are partnering to develop a new industrial center that will create jobs and spur economic growth in the region. 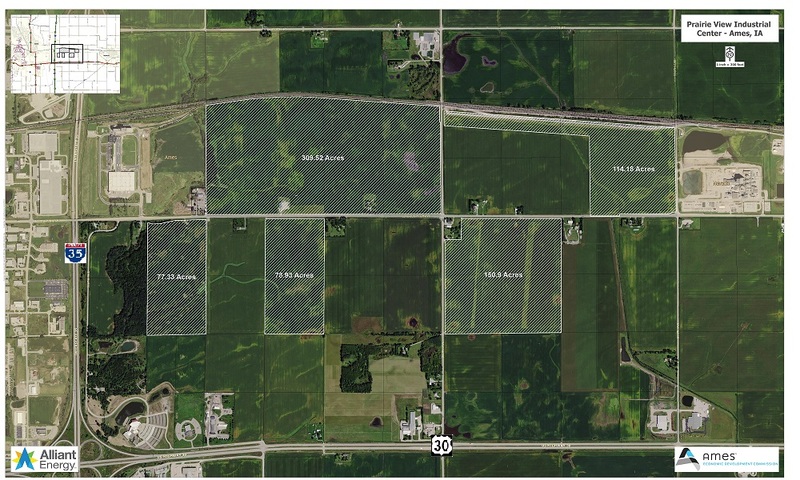 Prairie View Industrial Center will provide 730 acres of prime development along Lincoln Way on the east side of Ames. The land has double-rail access and is well-suited for any industrial relocation or expansion project. AEDC is working to certify the full site as a “Super Park” through the State of Iowa’s certified site program. The site will be fully served in 2018. The land is under option and available for $25,000 an acre. Alliant Energy’s efforts in industrial park development are designed to positively impact communities and add new large industrial customers to help the company manage its costs for all customers. Last fall, Alliant Energy announced Big Cedar Industrial Center. The mega-sized industrial park near Cedar Rapids is the largest rail-served industrial site in Iowa and one of the largest in the Midwest. This March, Alliant Energy and the city of Ottumwa announced a partnership to develop land in the city’s industrial center north of town. Find more information about how Alliant Energy is growing communities and supporting Iowa’s economy at alliantenergy.com/economicdevelopment.